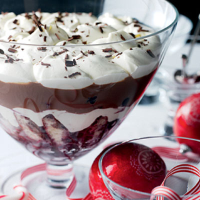 This wickedly indulgent dessert combines layers of chocolate custard, cherries, kirsch and cream, for a totally heavenly experience. Break 50g of the chocolate into small pieces and place in a bowl over a pan of simmering water (do not allow the water to touch the bowl). When the chocolate has melted, remove from the heat and stir in the custard. In a separate bowl, whip the mascarpone and cream with the sugar and vanilla until smooth and slightly thickened. Drain the cherries in a sieve over a bowl, reserving the kirsch. Arrange a layer of sponge fingers in the base of a large trifle dish or glass bowl, spoon some kirsch over the top and scatter over some cherries. Spoon over a third of the cream mixture. Add another layer of sponge fingers, kirsch and cherries, then the chocolate custard mixture. Spoon over another third of the cream mixture. For the final layer, add the remaining sponge fingers and kirsch, scatter over the cherries and top with the cream mixture. Decorate with the remaining chocolate, grated. Chill until ready to serve. sponge fingers. Keep covered in the fridge until ready to serve. If you prefer, make 8 individual trifles. The intense dark berry fruit flavours of a rich, sweet red Sparkling Shiraz, will go well with this dish. This recipe was first published in Wed Dec 02 00:00:00 GMT 2015.